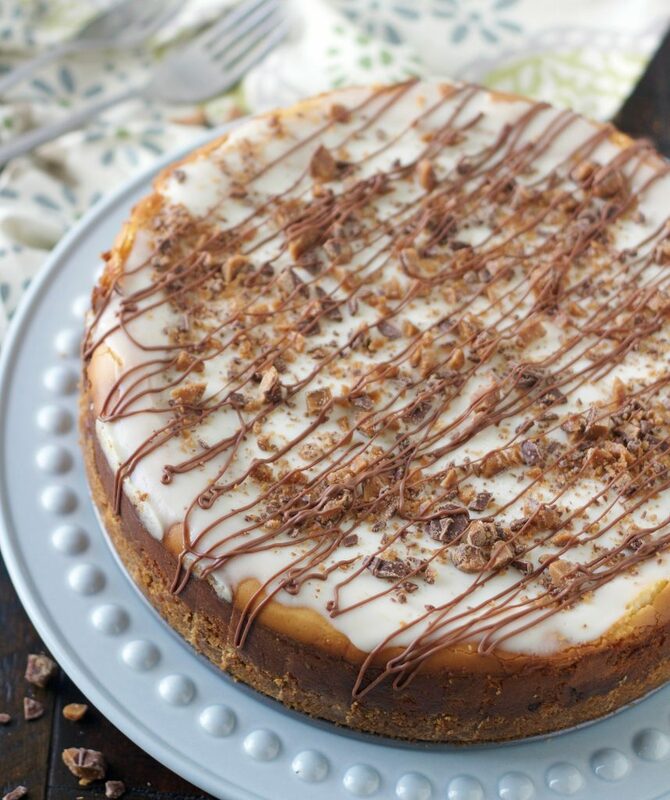 White Chocolate Toffee Bar Cheesecake is utter cheesecake perfection. Melted white chocolate and chunks of toffee bar. It’s truly phenomenal! This White Chocolate Toffee Cheesecake is actually a recipe I posted almost four years ago and I’m pretty sure it’s been lost among the hundreds of other dessert recipes I’ve shared since then. I think cheesecake is one of the most quintessential desserts around. I’ve always been a huge fan of cheesecake. I’ve never met a slice of cheesecake I didn’t like. Because I ♡ cheesecake so much, I wanted to bring this White Chocolate Toffee Cheesecake back into the limelight. It’s definitely deserving of being there. This cheesecake probably ranks in my top five favorites. What’s not to love about it . 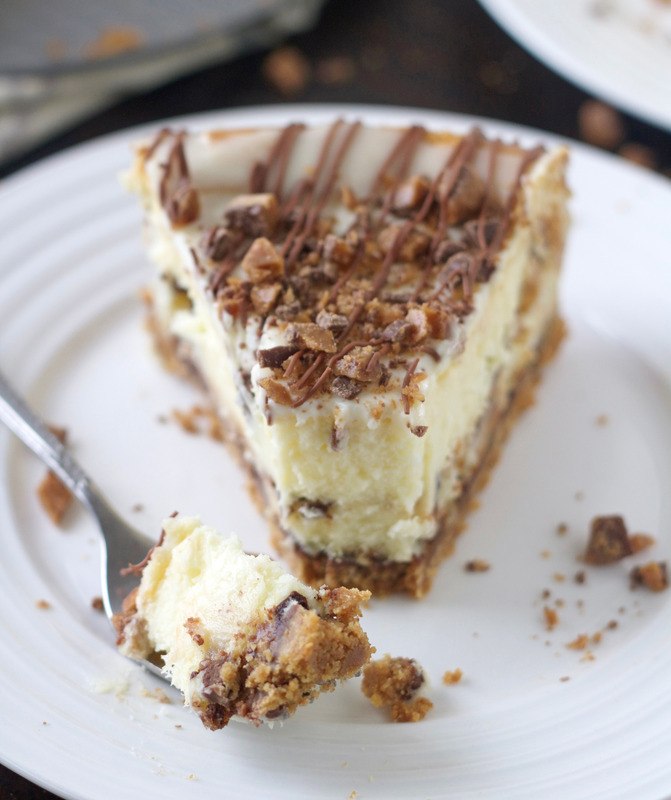 . . a graham cracker crust, two layers of chopped Skor candy bar and a white chocolate cheesecake filling. This is truly a show stopper, so if you’re needing a dessert to completely wow your family and/or friends over the holidays, then this is it! I can pretty much guarantee that the only regret you’ll have if you make this cheesecake, is that you didn’t see it buried in my archives and make it sooner. 3 pkgs. (8-oz each) cream cheese, room temp. Preheat oven to 350 degrees. Lightly butter the bottom of a 9 1/2 inch springform pan. Set aside. To make the crust, mix the graham cracker crumbs and melted butter in a bowl and stir until well combined. Press the the crumbs about 1/2 inch up the sides of the pan. Bake 10 minutes and then remove from oven to cool. To make the filling, chop the candy bars by leaving them in their wrappers and crushing them with a rolling pin, or unwrapping them and cutting them with a sharp knife (don't crush them fine, you want irregular chunks of toffee bar). Set aside. Melt the chocolate in a microwave-safe bowl. Cook for 1 minute, and stir and then do it it 30 second increments at 50 percent power, stirring well each time. Do this until it's smooth and completely melted. Place the cream cheese and sugar in the bowl of an electric mixer. Beat on high speed until light and fluffy, about 2 minutes. Add the eggs, one at a time, beating well after each addition. Add the vanilla and melted chocolate and beat on medium speed until well combined. 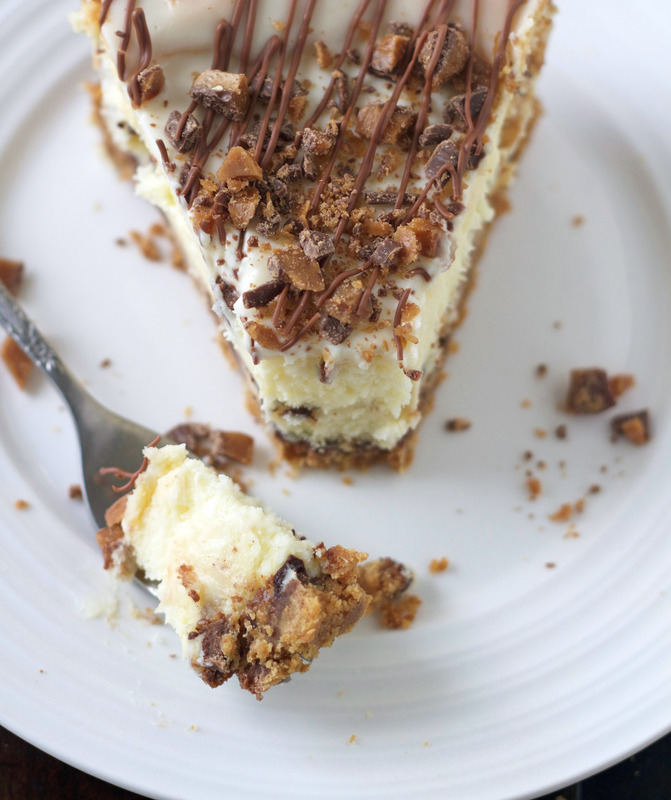 Sprinkle half the crushed toffee bars over the prepared crust. Carefully pour half the white chocolate filling over the crushed bars, spread evenly. Sprinkle the remaining crushed bars over the filling and then top with the remaining filling. Use an offset spatula to spread the filling evenly over the toffee. Place the cheesecake on a cookie sheet and bake for 55-65 minutes or until the top is very light brown in spots and the edges are firm but the center is almost set. Remove the cheesecake from the oven and cool on a wire rack for 20 minutes. To make the topping, stir the sour cream, sugar and vanilla together in a small bowl. When the cheesecake has cooled for 20 minutes, use an offset spatula to spread the topping over the top of the cake; spread it all the way to the edges of the pan. Return the cheesecake to the oven and bake for 5 minutes. Place the cheesecake on a wire rack. Run a dull knife around the sides of the cake to loosen it from the sides of the pan. Let it cool for about another hour and then put in the fridge for at least 4 hours. The longer the better! Sprinkle with more candy bar and drizzle with chocolate before serving, if desired. The cheesecake can be stored in the fridge for up to 5 days or you can wrap it in plastic wrap or place in an airtight container and freeze for up to 3 months. Defrost in the fridge overnight or at room temperature for 3 to 4 hours. Depending on your oven, you may have to cook the cheesecake longer than the given time. I ended up cooking my cheesecake closer to 70 minutes. You make sure all but about 2-3 inches of the center are set before you take it out of the oven. I always use Skor candy bar in this just because I like them better than Heath, but feel free to use whichever candy bar you'd like. 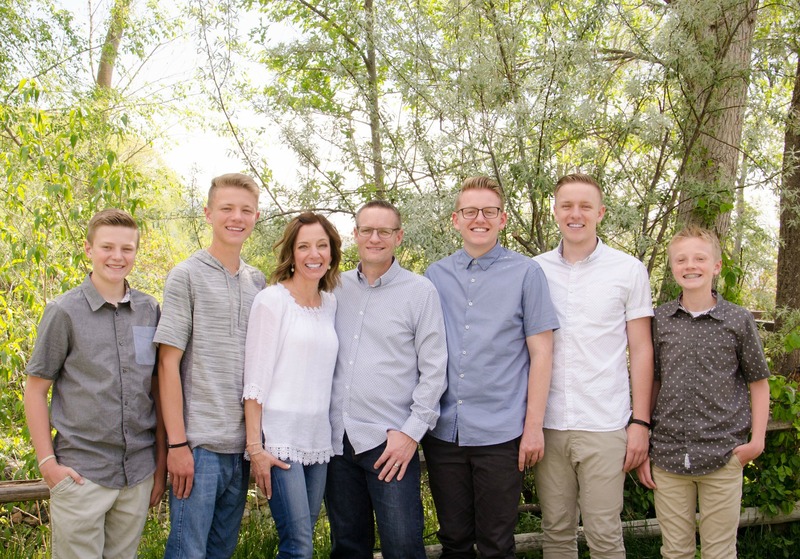 Jodi made this for a family party. It is Fantastic! My family went crazy over this cheesecake.